A couple of days ago, I reference an article at PJMedia about the global Malthusian movement. Most of us climate warriors recognize that this is one of the main underpinnings of the climate alarmism. The author wrote about “race- or caste-targeted forced sterilization programs instituted in Peru, India, and many other Third World countries with USAID and World Bank funds” and “environmentalist movement” consisting “of holocaust deniers, who continue to refuse to look at or admit the existence of the carnage they have created and continue to perpetuate worldwide”. I was disheartened a bit by some of the comments there. We must have population control, the planet cannot substain 10 Billion of those only 1 billion are smart enough to not crap where they eat or live. without some population control we will have water and land wars, destroy eco systems, plants, animals, birds & as we are doing to the ocean, we must keep population below 7 billion for a healthy planet. .Another………. And while killing newborns in China is terrible, the world population growth should be stopped, if we don’t have an option to immigrate to Mars. If we won’t stop it ourselves, it will just happen automatically by wars or mass starvation. The endless growth is obviously impossible, and the technology can only postpone this bitter end. And another……I wish the greenies WOULD be more concerned about overpopulation instead of left-wing politics. Obviously there must be a point where the earth can not support any more humans and we will be swimming around in our own feces. Of course, we’re used to seeing such horrific proclamations. Anyone who has been engaged in any environmental discussion inevitably encounters it. For people new to the discussion, I’ll briefly summarize the position. The thought is that humans consume too much of the earth’s resources. It is also believed the earth’s resources are finite and that once the earth’s population exceeds a certain point, we will inevitably consume all of the earth’s resources and doom humanity along with much of the flora and fauna of the earth. And so, they actively advocate and enforce population limiting controls such as the policies mentioned in the PJMedia article. Many of us scorn such a position. For one, the space the earth provides is nowhere near becoming a limiting factor. All of humanity can fit inside the state of Texas with room left over. Secondly, the Malthusians always consider earth’s resources in terms of the present. 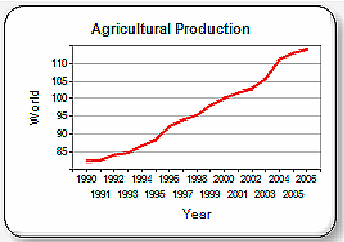 That is to say, when considering food availability, for example, they think in terms of present food production and compare it to future population projections. They do the same with water and fuel and any other resource. Malthusians often employ catch phrases like “peak oil” implying that we’ve used most of it up and that production is soon going to dramatically decrease. The fact that they are consistently wrong in such assumptions doesn’t deter them from expressing murderous thoughts. Well, along with these graphs, recently there were two seemingly unrelated discoveries/events which adds to the overwhelming mountain of evidence that Malthusians are wrong, and that their concern for humanity’s well-being is a cover for their misanthropy. As mentioned, Malthusians have a dichotomous mindset. In one hand, they express things in terms of the present and extrapolate to the future without consideration for the changing events the future always provides. First of all, our population is self-limiting. Malthusians always seem to consider our population growth as unlimited exponential growth. See our modern day Malthus, Paul Ehrlich and his “population bomb” delirium. To avoid a lengthier post I won’t detail why we are self limiting. I’ll simply hit some high points. In developed nations, the need for offspring is less than in developing nations. The U.S., for example, is a case in point. When much of the country was agricultural, the more offspring, the more hands available for work. There is little need for such today and so the family size is shrinking. One of the events mentioned is witnessing this dynamic in Japan. Japanese population is shrinking. So much so, that it has many people concerned with the future of the entire population. Japanese researchers estimate that the Japanese population has only about 1000 years left before their population ceases to exist. We see a similar dynamic in developed European nations were couples typically have less then two offspring. This cultish belief that we’re going to dramatically overpopulate the earth is simply laughable. As populations advance, reproduction rates decrease. But, what of the underdeveloped places? Food and water remain scarce resources thus limiting their ability to advance. The continent of Africa is one such place where concern in this matter is great. Well, it was. From the Environmental Research Letters a new study shows that the water resources of Africa have been grossly underestimated. 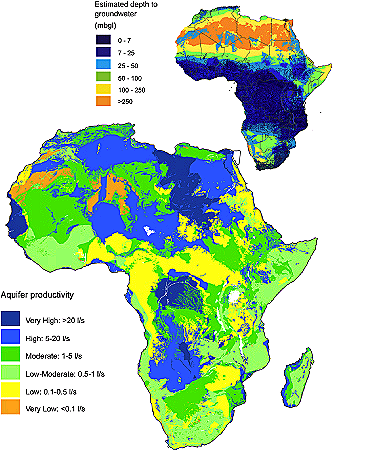 There are aquifers in Africa which can propel most of the nations there into productive nations with crop potential beyond any one’s prior estimates. The only hurdle left for African nations is if the people there are somehow thwarted from advancement. These can be divided into two camps. Political upheaval in local areas and interference from the Malthusians who wish nations and peoples to remain impoverished. Don’t let their murderous genocidal thoughts go unchallenged. Their purposes can be described as nothing less than malicious and malevolent and a danger to human advancement and freedom worldwide. This entry was posted in Climate, Economics, News and politics. Bookmark the permalink. Yep, humans occupy very little space on the earth. When viewing the dire predictions and projections of Malthus, Ehrlich and the rest of the lunatics, it’s simply astonishing that their thoughts are still prevalent today. Well, there goes my nice quite day! That PJmedia story has me so angry I could chew nails! These people should be in jail, not walking around as free men. It seems more and more folks are waking up. You’re right, there are some real monstrous criminals walking among us.